I am so glad that Spring is finally here! It’s like overnight the weather warmed up, the flowers started to bloom and the world became a much happier place in my mind! Beyond these small changes that make me super happy, the warmer weather also means that I can pack up my winter clothes and pull out my fun Spring essentials. 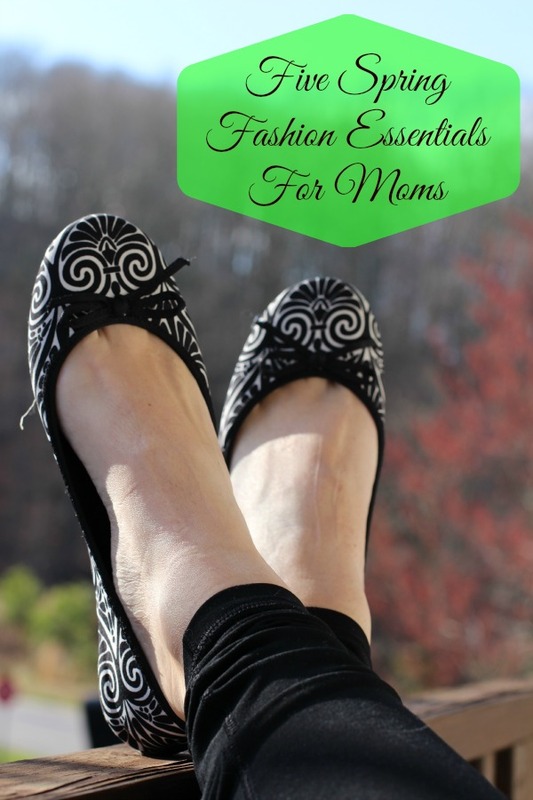 But that begs the question, what are my Spring fashion essential picks for busy moms? Well, this year I’ll all about simplicity and comfort! To achieve that look, I’ve made sure I have a few essentials in my Spring ready closet! Comfy Capris: I have to say that the boyfriend capri is one of my Spring favorites! It’s comfortable and oh so versatile with the ability to be dressed up or down. Adding a pair in lighter demin as well as darker demin ensures that you can keep your look consistent for almost any occasion. Fantastic Flats: I’ll just say it, I’m not a heels person. Especially in the Spring I love my flats in fun patterns so that I can go anywhere without having to worry about changing my shoes. Look for patterned prints and bright colors to add a little flare to your Spring wardrobe. Stunning Scarves: Did you know that a bright and colorful scarf is pretty much the perfect way to add a pop of Spring color to any outfit? While the infinity scarf is my personal preference, you can really do amazing things to your look with any scarf. For Spring fashion, look for bright colors and light weight fabrics! Great Glasses: No Spring look is complete without a totally rocking pair of shades! After all, not only do great sunglasses help complete your look but they also protect your eyes! This Spring look for oversized frames with sparkly accents to add a little something extra to your finished look! The Perfect Purse: Yes, ladies, what you carry is just as important as what you wear. And this Spring especially having that perfect purse is essential to your Spring look! Since we know how important this key piece of your Spring wardrobe is, we’re excited to give you the chance to win the absolutely perfect handbag for all your Spring looks! 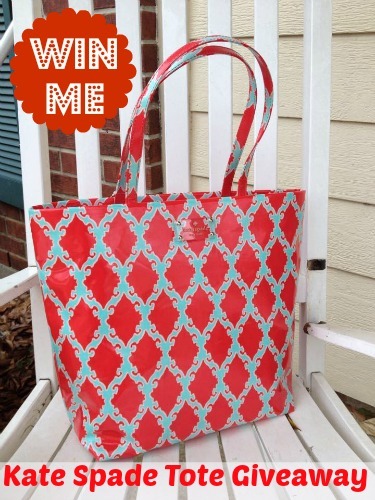 This authentic Kate Spade Bon Shopper Tote Bag is what Spring fashion is all about with bright colors and a fabulous print! This fabulous Kate Spade bag is the perfect accessory to add a pop of color to your spring outfit. So, are you ready to win it? Entry is super easy thanks to Rafflecopter. Just use the form below! Giveaway will end at 11:59 pm EST on April 10th, 2015. Giveaway is open to US residents only, 18+ except where prohibited by law. The Adventures of J-Man and MillerBug is not responsible for prize fulfillment. We received no compensation for this post. For Colorado weather it is tank tops and a hoodie to get us through any changes of weather. I think you covered all of them. Maybe lighter makeup for hot days. And sunscreen don’t forget sunscreen. You covered my favorite one, which is a scarf – but I also find myself drawn to just a wee bit of sparkle in the spring time! A light pastel flowery blouse is always nice with a large necklace in darker tones. Use a tinted moisturizer instead of foundation to show off your spring glow! A change in shoes and jewelry can update your winter wardrobe pretty quick! For spring, I like to always make sure I have a cardigan handy. You never know when you might get a little chilly. I’m definitely going to have to get on board with wearing scarves this spring. I love how feminine and flirty it can be! I love all the tips above…I need all the help I can get! I need to get a new pair of sunglasses though….those are a must for tired mommy eyes! I like to change my jewelry to more colorful, less chunky items for Spring. Keep those scarves handy! I still wear some of my scarves with short-sleeved shirts or light sweaters through the spring/early summer months. And take care of those feetsies and get a good pedicure (home or salon, whichever) so you’re ready for flip flop season! I enjoy wearing capris in fun spring colors. Layers! In case it gets cold, or too warm, you’re prepared! I always carry rain gear, and extra pair of shoes and an umbrella in the car for those surprising wet days. I always wear plenty of sunscreen. Increase in sunshine means increased time outside means more exposure for me! I love ankle cropped pants for spring! White jeans with a patterned blouse or chambray top is a great go-to — casual but crisp!